This review first appeared in the September 23, 1988 issue of the San Diego Evening Tribune. In the 10 years since the Little River Band was atop the charts, many changes and currents have moved through rock music  and the band itself, which has seen all kinds of personnel changes. But now that lead singer Glenn Shorrock is reunited with original bandmates Graham Goble and Derek Pellici, the band is again whole. 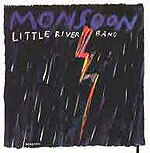 Throughout "Monsoon," the band's new album, there can be heard traces of bands that have come to the fore in the years since the band first broke through in the U.S. On "It's Cold Out Tonight," influences of the pop-ska band English Beat are prevalent. "Parallel Lines" sounds more like Men at Work than anything LRB did before. But none of these influences seem gratuitous or encroaching. Rather, LRB seems to have simply learned and absorbed from what's been going on around them and incorporated some of these influences into their own music. This album doesn't contain a bad song, and most are very good. "Love is a Bridge" could have come from their 1978 hit album "Sleepercatcher," and "Face in the Crowd" is an upbeat pop masterpiece.